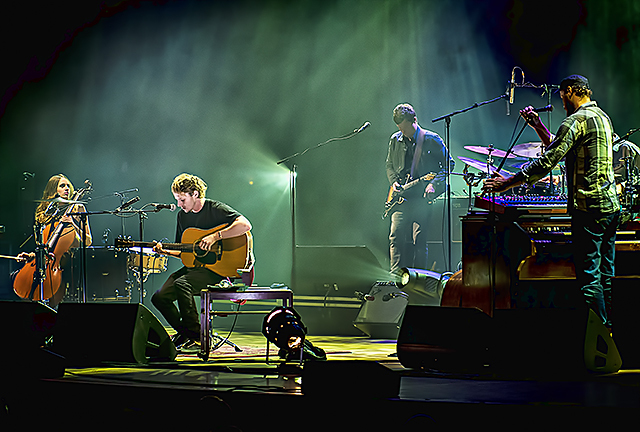 Despite the worsening weather conditions building outside of Massey Hall, Ben Howard managed to alleviate any concern for the outside world as he kicked off the first show of his two-night Toronto visit. The night started with last minute openers The Franklin Electric, who also played the night prior in Montreal. Showing no signs of being unprepared, the Montreal alternative folk band fit the bill perfectly and set the stage for Ben Howard to come on. They counteracted the weight found in Howard’s music with a lighter sound and managed to get the packed house to jump to their feet near the end of their set. After a brief break, and many mentions of just how much those around me enjoyed the opener, Ben Howard and his band made their way onto the stage. They were greeted with thunderous applause but shortly after the crowd fell silent. Throughout the performance, Howard commanded the attention of everyone in the room. Aside from the casual, yet scarce, shout outs from the crowd, it was without question that everyone was there to simply watch and listen intently. The set began with “Small Things,” the first track off of Howard’s newest album I Forget Where We Were, which was released back in October 2014. Though he sat for roughly half the night, Howard never lost his flair and excitement and “Small Things” was a prime example of that. The rest of the main set would deal heavily in Howard’s newest material including “Evergreen,” “In Dreams,” “Rivers In My Mouth,” “End Of The Affair,” and “Conrad”. It was “Rivers In My Mouth” that really set the night off as and “Black Flies,” an older song, got thrown in the middle and brought Howard back to his early beginnings. The crowd was also spoiled with a previously unreleased song that did not make it onto the album, called “Quiet Me Down”. Each song felt like a separate experience. The lights reflected the mood of each, bringing the venue from a pitch-black setting to blinding flashes that matched every beat of the kick drum. They acted as an instrument on their own, accompanying the already enormous sound coming from the stage. I felt as if I was somewhere else at times and was only snapped out of my trance between songs. The interaction with the crowd was limited but Howard graciously thanked everyone on a couple of occasions and even mentioned that he and the band had been looking forward to this show at Massey Hall for a while. Throughout the set, Howard would switch between acoustic and electric guitars, but often times the sound seemed almost unchanged. The tone he’s able to get out of his acoustic guitar resembles that of an electric. The harsh brightness I sometimes hear from live acoustic performances was used by the backing band and only for a short time. Howard’s acoustic was full of warmth and the deep lows were complimented by the highs, without them ever peaking or becoming overbearing. The guitar switches, I imagine, were for certain tunings or effects that each song required. Ultimately, listening back to the album, the live renditions matched up with the records perfectly and were flawlessly recreated, capturing Ben Howard’s airy and powerful sound. As the band was accepted back on to stage by a standing ovation, the encore included past favorites that long time Ben Howard fans would enjoy including “Oats In The Water” and “The Fear”. 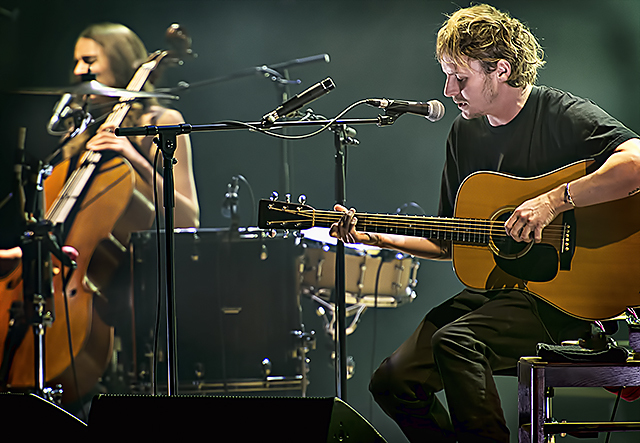 These songs were more stripped down as far as instrumentation went and showed how far Ben Howard’s sound had progressed from his older songs to the newest release. The crowd remained on their feet until the very end. 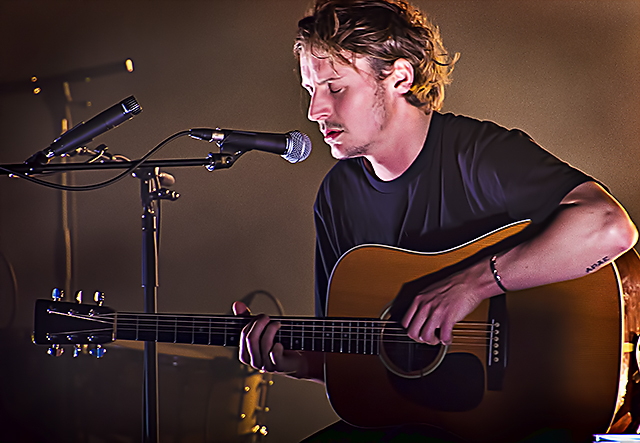 Ben Howard gave the audience a night to remember. The experience felt with each song, the amazing sound, and the mood throughout the night was the escape that’s fans could have only hoped for.